I fell in love in Fairbanks, Alaska—the land of the midnight sun—with sweetest girl in the valley. All five of our children were born there. We lived on a three-acre plot overlooking the Tanana Valley and the University of Alaska; a plot that backed up to old mining claims. With the kids, Merri Ann and I wandered those mining trails and explored old diggings. On our lot, where the slope banked into the summer sun, we cleared off the birch trees for a garden. We hauled in a truckload of peat and tilled it into the soil making it rich and thick. And then we read everything we could about gardening in the far north. With banked beds, ground cover to capture the summer heat, and over-ambition, we were awash with summer produce. We had beans and peas and broccoli. On the deck in planter boxes, we grew tomatoes—ripe by the Fourth of July. Potatoes thrived. We built a room to store potatoes, squash, and canned goods. But we never grew pumpkins. That didn’t mean that pumpkins didn’t thrive in the valley. Prize winners at the fair were over 50 pounds. But these were show pumpkins, not the sweet little meaty pumpkins that you want for pies. These we bought at the farmer’s market or at the store. In this article, I’ll tell you about pumpkins, how to choose them and puree them and I’ll share great pumpkin recipes with you. Pumpkins are versatile. You can bake a pumpkin, steam a pumpkin, sauté a pumpkin, make puree out of a pumpkin, and more. But where a pumpkin really comes into its own is in your kitchen. Pumpkins make favorite pies, moist cakes, interesting breads, and delightful cookies. The flavor is mild, maybe a little earthy. Typically, pumpkin is the canvas for an array of spices. When we think of pumpkin, we think of mixtures of cinnamon, nutmeg, ginger, and cloves found in pumpkin pie. There are two types of pumpkins—the decorative pumpkins intended for jack-o-lanterns and sweet, pie, or eating pumpkins. 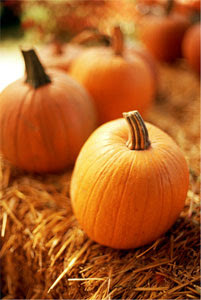 The larger decorative pumpkins used for jack-o-lanterns tend to be watery and stringy and are not very good for baking. Pie pumpkins are much better—meatier, smoother, and sweeter. When choosing pumpkins, select those that are firm and heavy for their size. Avoid those with soft spots or any signs of decay. Inspect carefully any areas that may be soiled with dirt from the field. The rind should be hard. Choose one that is small enough to use at one time since cut pumpkins will not keep as well. In the right conditions, your pumpkins will keep for two or three months. Store them in a cool, dry location. Space them so that the air can circulate around them. Ideal temperatures are 50-55 degrees. Once you cut into a pumpkin, it should be refrigerated. Chunks can be kept in your crisper where the atmosphere is moist or in perforated plastic bags for a week or more. For longer storage, cook your pumpkin, puree it, and freeze the puree. Properly frozen, your puree will keep in the freezer for six months. Raw pumpkin can also be frozen. Clean and peel the pumpkin. Cut the flesh into one-inch cubes. Place the cubes in freezer-type bags and freeze. Measure out what you need for your favorite recipes. Use within two months. 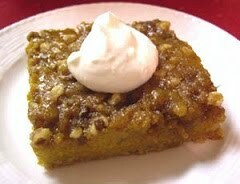 Pumpkin is mild and it’s gently earthy flavor is often used as palette to deliver other flavors–most often, spices. The most common spices are cinnamon, ginger, nutmeg, and cloves. Cinnamon is the mildest of the quartet and often hides behind the others. Yet, many times, I prefer to use cinnamon alone. A really good cinnamon melds perfectly with pumpkin. Korintje Cassia Cinnamon This is the most popular cinnamon used in the United States. A good cassia is pleasant, not astringent, and you can dip your finger in it and taste it. If you have a good cinnamon, you can use much more than what the recipe calls for—two or three times as much. Sri Lanka Cinnamon This is a very mild, sweet, woodsy cinnamon—a true cinnamon. It almost has a honey tone to it. It will get lost behind stronger spices like cloves or nutmeg but melds perfectly with earthy pumpkin. Vietnamese Cinnamon This is an exciting cinnamon. It packs a punch and fills your kitchen with sweet aroma when baking. Vietnamese cinnamon has more volatile oils and has a tone associated with cinnamon oil more than the ground spice. I love this cinnamon in an apple pie. You don’t need cloves and nutmeg when you use this spice. Yes. We prefer fresh but we suspect that we’re biased. Quite frankly, in many recipes, we have a hard time telling the difference. And we often use commercially canned pumpkin for the convenience. Cut a sugar or pie pumpkin in half. Remove the seeds. Let the pumpkin cool until you can handle it without burning. Scoop the flesh out of the pumpkin and place it in a blender, food mill , or food processor. Process until smooth. If you have a Victorio-type strainer, you can process the cooked pumpkin with the skin. The strainer will separate the skin from the pulp. Often, especially from smaller or immature pumpkins, the puree will not be thick enough—a spoon should stand upright in the puree. To thicken, place the puree in a saucepan and cook, stirring often, until the puree becomes thicker. 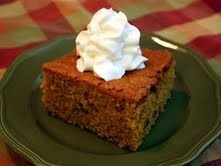 This is one of Merri Ann’s favorite pumpkin recipes. We’ve been making these fritters for a long time. These make wonderful breakfast fare but we’ve served them often on chilly fall evenings served alongside a soup or a salad. 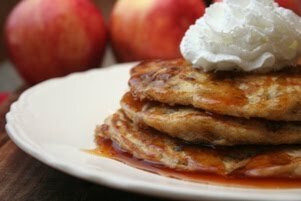 Mostly we have served them drizzled with maple syrup but they are also wonderful with cinnamon apple syrup, maple cream syrup, cinnamon cream syrup. 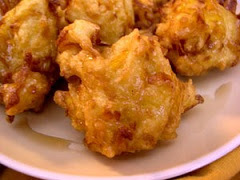 You deep fry these pumpkin fritters just as you would French fries. The fritter batter mixes together quickly so this is a quick dish to put together for those evenings when you just don’t have a lot of time. It’s also very economical. Mix the flour, salt, baking powder, and nutmeg together in a large bowl. Add the milk and eggs and stir until mixed. Add the pumpkin and corn kernels. In a deep fryer or heavy pan, heat enough vegetable oil for deep frying. The oil should be very hot, 375 degrees. Drop three or four large spoonfuls of batter into the hot oil. Let them cook for three or four minutes, turning once, or until they just start to brown. Remove them to dry on paper towels. 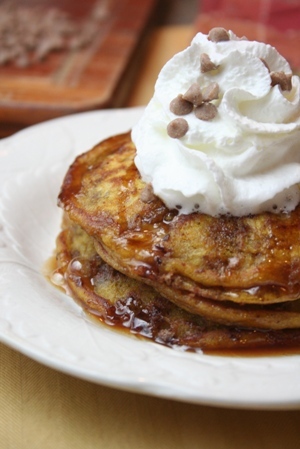 Serve immediately drizzled with maple syrup. When we were first married, Merri Ann started making Pumpkin Pie Squares—I think from an old Farmer’s Home Journal recipe. Over the years, we tweaked it a little here and there and adopted it to different sized pans. It’s like a pumpkin pie on a baking sheet with pecans added and has been a go-to recipe when we’ve needed to feed a crowd. Except for Ben who doesn’t like nuts, our kids prefer this over pumpkin pie. This recipe is designed for a small, a medium or a large batch. The chart below sets forth the ingredients for each. Use the ingredient amount in the first column for a small batch. Use an 8 x 8-inch baking pan for the small, an 8 1/2 x 13-inch pan for the medium, and a 10 x 15-inch pan for the large. For the crust, cut the butter into the sugar, oats, and flour until crumbly. Press the ingredients into an ungreased baking pan, across the bottom and up the sides. Bake the crust for 15 minutes. 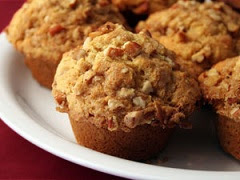 For the topping, cut the butter into the nuts, flour, and brown sugar. Set aside. For the filling, combine all ingredients in and whisk until smooth and all ingredients are evenly distributed. Pour into the baked crust. Bake for twenty minutes and remove from the oven. Immediately, spoon the topping over the filling and bake for another 15 to 20 minutes or until a knife stuck in the center comes out almost clean. Cool on a wire rack. Garnish with whipped cream. Pumpkin has a neutral, earthy flavor. Typically we rely on spices to deliver the flavor—most notably, cinnamon. I recent years, we’ve taken to adding cinnamon chips to our pumpkin recipes from pumpkin bread to cookies. The burst of cinnamon in every bight is delightful. Preheat the oven to 325 degrees. If you are using a dark pan, preheat to 300 degrees. 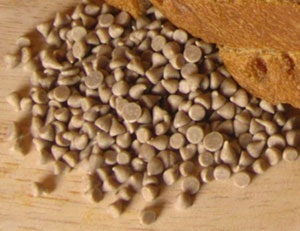 Mix the flour, baking powder, baking soda, salt, cinnamon, and allspice tighter in a medium bowl. Set aside. Cream the shortening and sugars together. Add the eggs one at a time, beating after each. Beat the mixture until light and fluffy. Add the maple and pumpkin and combine. Alternately add the flour in three additions and the milk in two, starting with the flour. 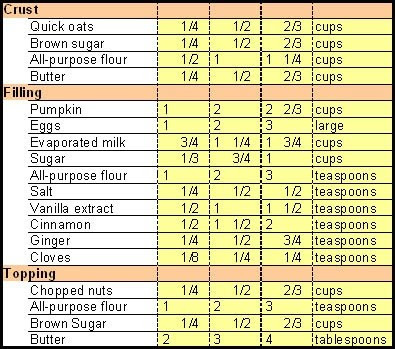 (Adding the flour and milk in stages will better balance the batter.) Add the chips. Scrape the batter into a well-greased 8 1/2 x 13-inch pan. Bake for 50 to 55 minutes or until the cake tests done. Cool on a wire rack. For the frosting, beat the cream cheese and butter together. Add the powdered sugar and continue beating. Add the vanilla and lemon juice. Add just enough water to bring the frosting to a spreadable consistency. Frost the cake after it has cooled. Dennis Weaver is the president of The Prepared Pantry. The Prepared Pantry sells baking ingredients and tools including the kitchen tools and spices and other baking ingredients that you will need for baking with pumpkin. They also sell baking mixes including mixes for pumpkin bread, cookies, pancakes, and muffins. What Can You Make With Cinnamon Chips? We were in Salt Lake, stopped at a bakery, and bought their cinnamon chip bread. It was great. We loved them. We put them in cookies and cakes; pancakes and bread. We decided to package them in consumer-sized packages. And they took off. We sell a lot of these chips. We sell them online but our local customers—they’re really passionate about their chips. They are our best selling product in our store in Rigby, Idaho. Favorite cinnamon chip recipes get passed around in our local community. Some have been published in our local paper. 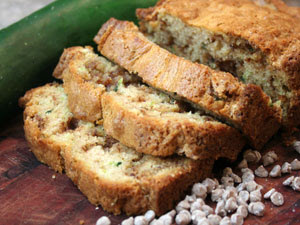 Cinnamon chip zucchini bread and cinnamon chip banana bread are the most popular recipes. The zucchini bread recipe is so popular in the Idaho Falls area that we advertise it on the radio. 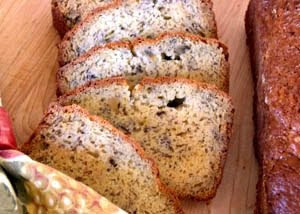 You’ll find both the zucchini bread recipe and the banana bread recipe in this article along with a link to more recipes. More importantly, you’ll learn how to use these chips in your favorite recipes. Nearly any recipe that calls for cinnamon is a candidate for cinnamon chips. 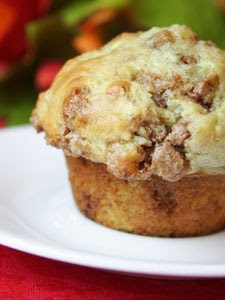 Put cinnamon chips in breads, scones, muffins, cookies, and pancakes. Add them to almost any recipe that calls for cinnamon—you’ll add a burst of cinnamon in every bite. Always add the cinnamon chips right at the end of the mixing or kneading process. Do not over mix. These are mini chips and may melt with extended mixing. Everyone loves banana bread. 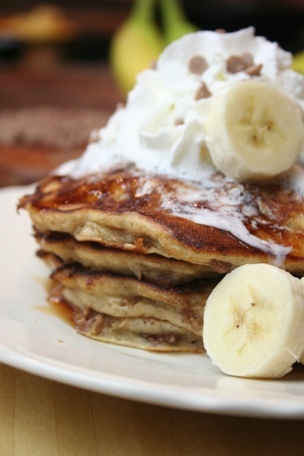 But we’ve found that it’s hard to get enough flavor with only bananas. It needs a boost from banana flavor. We added a touch of lemon to contrast and make the banana flavor sharper. We added cinnamon chips to provide a burst of cinnamon in every bite. This is scrumptious bread. Like most quick breads, it improves after being refrigerated overnight. Preheat the oven to 350 degrees. Prepare an 8 1/2 x 4 1/2-inch loaf pan by greasing the pan well and flouring it or lining it with parchment paper. Carefully measure the flour and then combine with the oats, baking powder, salt, and cinnamon. Set aside. 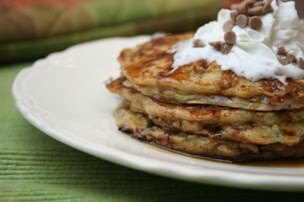 Mix the mashed bananas, melted butter, sugar, eggs, and flavors together. Add the wet ingredients to the dry ingredients and combine. Add the cinnamon chips and nuts. Scrape the batter into the loaf pan and bake for fifty minutes or until the bread tests done with a skewer or toothpick inserted in the center of the loaf. Place the pan on a cooling rack. After five minutes, remove the loaf from the pan and continue cooling on a wire rack. Baker’s note: We debated adding the lemon flavor; we’re glad that we did. It really sets the banana flavor off and even with 1/2 teaspoon is noticeable. 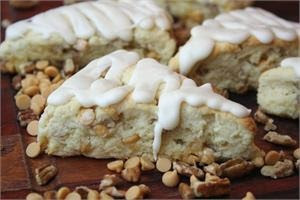 This recipe came to us from Kara Orgill who visits our store and is an excellent baker. In a large bowl, whisk the flour, baking soda, baking powder, cinnamon and salt together. Set aside. In a smaller bowl, whisk the eggs, sugar, and vanilla together. Fold in the sour cream, oil, and zucchini. Add the wet ingredients to the dry ingredients and stir until just combined. Stir in the cinnamon chips. Do not continue stirring. Pour the batter into two well-greased 8 1/2 x 4 1/2 inch loaf pans. Bake for 55 to 65 minutes or until done. Cool for ten minutes on a rack before removing the loaves from the pan. Where can you buy cinnamon chips? online. Hershey makes them for the fourth quarter. We would like to think ours are. The online reviews, on our site and elsewhere, suggests that ours are best. But try them and see. Wherever you buy them, be sure and get mini chips. They work much better than larger chips.